On the second day of our West coast swing, we stopped into the gym at Cal Lutheran University in Los Angeles, where Wake Forest’s Al-Farouq Aminu and Ishmael Smith have been working with Dave Leitao and David Hopla to prepare for the draft. Hopla, a highly renowned shooting coach who has worked with the Wizards and Raptors, was spear-heading the sessions this week, which placed a heavy emphasis on shooting. They players will transition to more diverse workouts next week. Al-Farouq’s brother, Alade, who spent most of last season in the D-League, also flew in to get in some work. Jerome Dyson and Daniel Orton have also been working out here, but both were out of town for workouts on the day we stopped by. 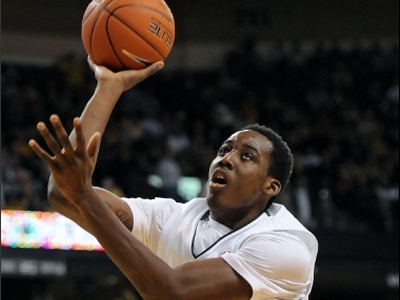 The fifth-ranked player on our latest mock draft, Al-Farouq Aminu’s biggest selling points have always been his elite physical tools, his strong work ethic, his versatility on both ends of the floor, and his massive upside. Shooting ability is not something many would list among his strengths, which is why the work he’s putting in here is so important. While it’s hard to take away anything definitively from a single workout only three days into his pre-draft training, what we saw here was very impressive, and a great sign for the likelihood he reaches his tremendous potential down the road. Aside from his shooting, Aminu impressed in other ways as well, namely by showing off his excellent athleticism in transition drills. Catching a rebound on one end, Aminu looked completely natural putting the ball on the floor and taking it for a lay-up on the other end, doing it in just three dribbles every time, giving you an idea how much ground he is capable of quickly covering. Aminu’s body in general was also impressive as expected, and not something he needs much work on, with core training being the primary emphasis of his strength work at this stage as his body continues to naturally fill out. Aminu’s work here is geared primarily toward making him a more complete player, with the specific work he’s doing likely to ease the transition to the small forward position should a team want to play him there. He certainly has the versatility to play either the 3 or the 4 with his outstanding defensive tools, but if he can really step up his shooting as he did here today while also continuing to refine his ball-handling skills, his best long-term potential likely lies at the small forward spot. Aminu isn’t scheduling workouts until after the lottery drawing next week, and will continue to stay in Los Angeles working on his game in between workouts up until the draft. At only 19 years old, despite being a sophomore, Aminu is just 15 days older than John Wall and 38 days older than DeMarcus Cousins, which is another reason why many consider his upside to be so high. Unlikely to fall out of the top 10, Aminu should get plenty of looks early in the lottery and could definitely help himself with some good team workouts, especially if he keeps on improving during his training. AA: It's just more attention to detail. It's not just “get the shot up”, its make sure you stay low, make sure you get your hand up, make sure you finish. One of the quickest players in college basketball, the thorn in Ishmael Smith’s side has always been his shooting ability, converting a very poor 49% from the free-throw line this past season, a number nearly unheard of for a point guard. He likewise shot poorly from the field, at 22% from the three-point line with just a 44% True Shooting percentage. Coming into pre-draft training, Smith was well aware that he needed to fix his shot to have a chance in the NBA, and he’s come here humbled and hard working, doing everything he can to improve. Smith’s shot required a lot more tweaking than Aminu’s, unsurprising given his previous results. Coach Hopla had multiple points of emphasis for Smith, namely keeping his elbow in, setting a consistent release point, and most of all, putting in a lot of repetition with the new mechanics in order to start overriding muscle memory. Even after the three-hour session completed, Smith spent more time working one-on-one with Hopla, fine-tuning his mechanics from the free-throw line. In drills, things looked good for Smith early on, with him hitting 15-for-20 spot-up jumpers from the 15 foot range at one point, but as fatigue set in later in the workout, the results weren’t as good, and he struggled to maintain consistency. Reading too much into these results just three days into the training probably won’t yield many useful insights, as it’s incredibly difficult to make so many changes in such a short period of time. The important thing to note is Smith is clearly putting in the work and understands what he needs to do to improve, even if it could be a very long process. A long-shot to be drafted at this stage, Smith should have chances at finding a way into the NBA this summer or down the road, and how he improves as a shooter will be critical in increasing those chances.